This is or was the government blog. My plan was to read the comments until I reached a comment that supported Conroy. There are some great comments in there. I reached page 10 and every single comment was against Conroy. The people have spoken. This attempt by the government to appear tuned in to the blogosphere has turned into a public relations fiasco. This is written from the perspective of University students and teachers. Nevertheless, it is also a very interesting commentary about learning theory and the role of technology in education in general. I've been saying for some time that there is no unified learning theory and that good teachers cherry pick from a variety of approaches. Wieman's approach plays nicely with my views. These similarities in how we learn dwarf any alleged differences in learning styles. Individual differences and gaps in knowledge can be systematically categorised and built into the instructional design framework. I'm familiar with this from using the interactive Learning in Science approach (Osborne / Freyberg), which systematically explores children's existing views of various scientific phenomena. There is more to the Wieman article. His focus is about how to optimize university instruction to increase effectiveness and productivity. His critique of current practices in Universities is most enlightening. The whole article is well argued, well written, worth reading in full and much of it is applicable in other (non university) settings. I wrote a blog about Teach for Australia in February 2008 and it is still attracting comments, so I'm revisiting it here. "The commonwealth has already committed to funding a $500 million national partnership to improve teacher quality, and Ms Gillard announced on Wednesday night a scheme to attract the best university graduates into teaching. Ms Gillard called on businesses to support the program, based on the successful Teach for America scheme, which will recruit top graduates to work in disadvantaged schools before they start their careers in areas such as law, accounting or management consulting. A joint venture between Noel Pearson's Cape York Institute and Macquarie University is expected to launch Teach for Australia next year"
"While the teachers learned how to use the XO very quickly, I miscalculated how difficult certain actions would be for them. 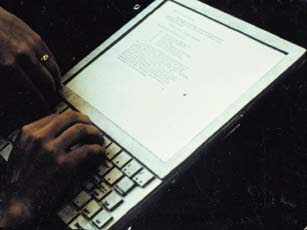 Specifically, it took them a while to learn “dragging and dropping” with the touchpad. Many of the best activities on the XO require serious dexterity with the touchpad such as TurtleArt, Etoys, and Scratch. For this reason we couldn’t cover these activities during training. I recommend starting teacher training with activities that do not require a lot of dexterity with the touchpad"
I've started a new wiki, universal communication. Tony Forster, who understands the engineering side better than me is helping too. Colombia is reported to be about to buy 20,000 and Ghana is reported to be about to buy 10,000. In addition, Ethiopia, Rwanda, Haiti, Mongolia, Afghanistan have approx 5,000 XOs each provided by the Give1-Get1 program. So far, the governments which have purchased large quantities (not just pilots and not recipients of the G1G1 – Give one, Get one - scheme) of XO’s are Uruguay, Peru and Mexico. 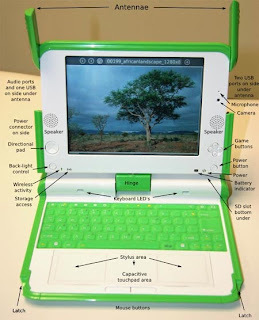 I am not suggesting that the OLPC is not a great technology for the poor children of the world. They need personal computers for maximum benefit. But due to the economic bottom line for some countries at the moment it is too much to expect that they will get there without assistance. Also we need to consider transition technologies like the above to bridge the gap. Another related issue is the best method(s) of electricity generation for poor countries. This is held over for another article. But with respect to his vision it does seem clear that we have become far too techno-centric in the way we conceptualise the computer - as a bunch of more or less independent applications to get various jobs done, rather than as an integrated vehicle to augment our co-evolution. Senator Conroy (The Minister for Broadband, Communications and the Digital Economy), the filter guy, has created a blog! "thoughts and ideas about the digital economy ... We aim to release the Future directions paper early next year"
... nevertheless, most of the comments I have read (there are hundreds) are articulate, well reasoned protests against Conroy's plan for a mandatory ISP level internet filter. So be it. If this is meant to be an exercise to demonstrate that our government is going to listen to us then let's hope they take the hint. "Jerome Bruner ... wrote the best book on education that has ever been written, Towards a Theory of Instruction"
I followed this up and found a great page (jerome bruner and the process of education) which summarises Bruner's thinking. I notice how Bruner takes concepts from both sides of the conventional curriculum wars and welds them together, for instance, he thinks that both structure and intuition are important. I summarise his approach as briefly as possible as incorporating structure, readiness, intuition, motivation. Could it be that ideas that are 40-50 years old have more relevance to education reform than many of the educational ideas floating around today? 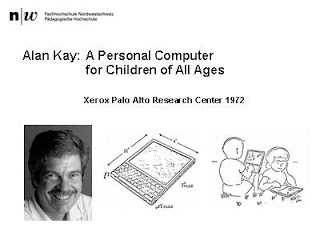 Could it be that ideas from the pioneers of computing (McCarthy, Engelbart, Papert, Kay) have more relevance than many of the computing ideas floating around today? I've been playing with inform 7. It is very interesting and I think I'll be using it in 2009. I'd also like to show it to some English teachers and get their reaction. "Inform is a design system for interactive fiction ... In place of traditional computer programming, the design is built by writing natural English-language sentences"
The bathroom is a room. The mat is in the bathroom. "The cat sat on the mat" still doesn't work but I'm getting there. "IT'S NOT THE TECHNOLOGY, STUPID"
How can they be learned with the aid of computing media? Can this work with human mentors? "Why was the dynabook never built in spite of all these people trying to make it happen?" "Purchase two XO laptops. Give one to a needy child in remote Australia or the Pacific. The other is yours to give to a child in your life"
Can it work with computing mentors? "The person who only knows his own generation remains forever a child"
I've added Dale Clapperton, internet freedom fighter, to my blog roll. Dale has some very funny videos on his blog as well as expert commentary on the law and internet censorship. 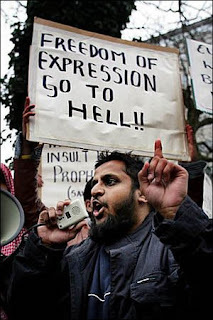 The current push to censor the internet in Australia was initiated by secular intellectuals Clive Hamilton and Michael Flood in 2003. The EFA site has the timeline and the analysis. A recent article by Kerry Miller, initially at StrangeTimes and reprinted at ON LINE Opinion argues that the Labour Party (so called progressives) is far worse than the Liberals (so called conservatives) on this issue. In this case of internet censorship it's good to see The Greens and the Liberals are opposed to our current Labour Party government. I've been contributing to the comment thread of this article at On LINE Opinion. As part of my research I came across the above article by Syd Walker. I think this article is important because it directly answers and refutes the secular moral argument put by Clive Hamilton. Syd Walker's article responds to those views. The world wide web is without precedent. The analogy with most other media does not hold up. If you are going to make an analogy then the best one would be the postal service. Censoring the WWW is more like censoring a public mail service. Big Media is controlled by a handful of people. The web is grassroots information liberation. Any censorship means that some of the vast array of web pigeon holes may be blocked without us knowing what is being blocked. This directly threatens the most significant information liberation experiment in the history of humans. It is well known that any attempt to block part of the web will also have "unintended consequences" (which the advocates of censorship are aware of so they are not really unintended) of blocking other parts as well. We don't know what is being blocked until the blocked list leaks, which inevitably it will as Mark Newton has demonstrated. A similar list in Finland was found to contain an anti-censorship site. The core issue is this: Do we dare to be free? Being free does mean being exposed to unsavoury things. Do we as adults want some other adults to protect us from those unsavoury things, without even full knowledge of what they are. That is the core issue and Syd Walker's article articulates that core issue at length. If another adult is going to protect me from unsavoury things then I want to know why that adult feels that he or she is superior to me? Why does that adult feel that he/she can handle freedom but I can't? btw I disagree with Syd about many of his beliefs expressed in that article - that reinforces the central point that I support his right to propagate those beliefs, as he does mine. Mark Newton is angry and he isn't going to win any diplomacy awards. But he sure knows what he it talking about when it comes to the Australian Labour Party's proposal for mandatory internet censorship at ISP level. He applies real heat to the government because he is expert, determined and they can't answer his comprehensive critique. Thank you for extending the opportunity for me to meet with you on November 3rd 2008 to discuss the ALP’s moves towards implementing a national Internet censorship scheme. Sincere apologies if you think I came on a bit strong. I had been advised that I had only 20 minutes, and I had a lot of territory to cover, and you kept me busy by providing more inaccuracies which required corrections which added even more time pressure. I hope I managed to get my message across, and I intend to use this letter to reinforce the key points. I spent significant time debunking your assertion that other countries have implemented systems similar to the ALP’s proposal. Both of those assertions are factually baseless. Even Minister Conroy has backtracked on them in recent days, in response to questions in Senate Question Time from Western Australian Senator Scott Ludlam, which accused the Minister of making false and misleading statements in Senate Estimates on October 20th and enquired whether the Minister would be issuing a retraction1. The Minister followed up on November 13th 2008 with a clarification2 which backtracked on his previous assertions by distinguishing his (and your) International examples from the ALP’s proposals. I feel confident that if we had had our meeting today rather than two weeks ago you would have said different things about the ALP’s proposals, in response to Senator Conroy shifting the ground beneath your feet, and I have sympathy for the difficult position he has placed you in by embarrasing you with misleading, inaccurate and incomplete information. I understand that you are a mere cog in a larger Party machine, but I would guess that you would be professionally (if not personally) offended by the inaccurate information which your Party has provided to you, and which you are in turn providing to your constituents. Senator Conroy’s repeated inaccurate and misleading assertions have painted him in a very bad light, and you might perhaps do well to consider whether repeating his Ministry’s discredited rhetoric is likely to damage your own reputation. During our meeting, I outlined several points against the adoption of the ALP’s policy. I will briefly address each point below, and request that you, in turn, address each point in your response. The Government has claimed that the purpose of the policy is to protect children5. They were not rhetorical questions. I believe the Australian public deserves to have them answered. Please answer them. A worthy demonstration of the lack of public desire for filtered Internet connectivity was provided by Mr. Steve Dalby of iiNet on MMM’s “Spoonman” show10 when he asserted that iiNet’s website has been offering free filtering software for four years and zero customers have downloaded it. Since the implications of this policy came to light, the Internet community in Australia has been working hard on free and effective circumvention methods13. Websites devoted to bypassing mandatory ISP censorship have been erected, and the ALP’s policy has been rendered useless before it has even been implemented. It is safe to say that everyone who is inconvenienced by the ALP’s censorship system will routinely bypass it at will. The Government claims to have committed $44m to its “clean feed” proposal. However, the Minister has not been drawn on whether the money remains available in the wake of budget “refactoring” due to the financial crash; and even if it is available, he has not provided a breakdown of how much would be available for ISP compensation and how much would be swallowed up by the ACMA bureaucracy to run the scheme. My personal direct experience is that it will cost in excess of $2m in the first year to fit-out an ISP which provides service to 2% of the Australian market, with a 50% premium in subsequent years for ongoing licensing fees. With conservative allowances for network growth, that easily turns the five year process into a $500m scheme, with the Government providing less than a drop in the ocean, leaving the remainder to be provided to the Industry by ISP customers in the form of higher ISP bills. In the current financial environment, imposing a half billion dollar mandate on ISPs to provide an unwanted solution to a nonexistent problem is disgraceful. Doing so with the full knowledge that it won’t work is lunacy. Despite Mr. Conroy’s repeated misleading statements about the infallibility of the ACMA blacklist, the current scheme is already implemented poorly. According to the ACMA “Report on the Co-regulatory Scheme for Internet Content Regulation”14 covering the first six years of the scheme, less than half of the URLs gathered onto the Prohibited Content list by the ACMA were arguably illegal material. Note that since the Act does not require the ACMA to seek a classification decision from the OFLC before adding overseas content to the blacklist, this really is a case of one public servant’s personal discretion deciding whether a content item should be banned in Australia, with no mechanism for notification or appeal. In your opinion, does that represent good governance? Shouldn’t we expect better? As I asked in my first letter to you, is it wise to place the same calibre of bureaucrat who decided Mohammad Haneef was a terrorist suspect or that Bill Henson was a pornographer in charge of a secret, unaccountable blacklist? During our meeting you scoffed, but that really is what we’re talking about here. If we suspend disbelief for long enough to accept that the scheme will be administered by perfect public servants with perfect discretion and perfect oversight, then we would clearly end up with a hypothetical blacklist containing only illegal material. The Government would then require that blacklist to be distributed to several thousand employees at several hundred ISPs, whereupon it will certainly leak. I am prepared to accept debate about how long it will take to leak, but the fact that it will leak is beyond question. As I pointed out in my original letter to you, once it leaks it will be available to every Internet-connected pervert on the planet, and any Australian perverts who avail themselves of circumvention methods. With any perceived positives accompanying the scheme undermined by the fact that it won’t work, the negatives will be all we have left. Is increased world-wide child abuse an acceptable price that you, personally, are prepared to pay for the implementation of this policy? During our meeting, you asked whether there were any policy alternatives which you could take to Mr. Conroy as a constructive addition to the criticisms contained herein. I pointed out that the Internet Industry Association (IIA) already runs a “Family Friendly ISP” programme15, which provides accreditation to ISPs which conform to the programme’s Family Friendly ISP policy. These ISPs offer a variety of services, including “clean feeds,” to members of the public who desire them. It is worth noting that these ISPs’ services tend to be more expensive than “traditional” ISPs’ services16, and that extra expense may represent an obstacle to families acquiring their services. My recommendation during our meeting was that the Government should find a way to encourage and promote those kinds of companies, perhaps using the $44m in “clean feed” funding to assist existing “clean feed” ISPs with advertising. On November 10th 2008, the System Administrators’ Guild of Australia (SAGE-AU) made an alternative proposal, suggesting that the Government’s budgeted $44m could be redirected to accredited “Family Friendly ISPs” by means of a grant programme modeled on the Australian Broadband Guarantee, “... wherein a participating ISP is subsidised for each subscriber.”17 The Guild also pointed out that a side effect of the Government’s current proposal would be to destroy existing family-friendly ISPs by “commoditizing” their industry niche, thereby punishing the companies who have already done the most to support the aims of the Government’s policy, and their alternative proposal cures that deficiency. The IIA and the civil liberties community have supported SAGE-AU’s proposal, and it seems to me that it would be an honourable and controversy-free way for the Government to extricate itself from this mess. The fact that Government representatives keep making wildly inaccurate statements about their Internet censorship proposal makes it abundantly clear that the ALP did not think this policy through before adopting it. Other organizations and individuals have clearly applied a lot more thought to these matters than anyone in the Government ever has, and my strong recommendation is that the Government should listen to them. The final point in our meeting concerned Mr. Conroy’s inappropriate behaviour towards me, the IIA and my employer. I must admit to being slightly stunned by your claimed unawareness of this conduct, because I had drawn your attention to it on the cover sheet of the faxed copy of my letter, which was sitting on the table in front of you even as you denied any knowledge of it. It has been widely reported18 that during the week of the 24th of October 2008 Senator Conroy’s Chief Political Adviser, Ms. Belinda Dennett, emailed a board member at the IIA to express “... serious concern that an IIA member would be sending [my criticisms]...” and labeling the expression of my political views as “... irresponsible behaviour.” The email message was accompanied by a phone call demanding that it be passed on to the owner and Managing Director of the company which employs me. It was grossly inappropriate for the Minister to use the IIA as a tool to place pressure on my employer over my personal political views. That reprehensible style of conduct is beneath the dignity of a Minister of the Commonwealth, and cheapens the professionalism of Mr. Rudd’s entire front bench. As a fellow member of that front bench, and one of Mr. Conroy’s colleagues in the party room, your choices are to either publicly distance yourself from his outrageous behaviour, or, through your silence, indicate your acceptance of his excesses. If you have any integrity you will speak out against him, but if you do not then Australians will know exactly where you stand. Regardless of your personal judgement on the matter, I require you to convey to the Minister my demand for a written apology for his unprofessional and inappropriate conduct, and for the conduct of his subordinate Political Advisor. I also ask that you communicate the matter to the Prime Minister, Mr. Rudd, and convey my belief that if Broadband was half as important as he said it was before the last election perhaps it would be a good idea for him to put a grown-up in charge of the Broadband Department. In my previous letter, I stipulated that there were a great many serious, well-considered, thoughtful and well argued reasons against the Government’s Internet censorship policy. I also expressed disappointment at the fact that we have been debating this issue for over a year and none of those issues have been addressed by the Labor Government in general, or Mr. Conroy in particular. By the time you read this letter, another month will have passed since you took receipt of my original letter. And, despite the increasing public profile that this issue has been receiving, the Labor Government in general, and Mr. Conroy in particular, still refuse to address any of these concerns on their merits. The Minister’s continuing poor conduct over this issue does little to inspire confidence that any of these criticisms will ever be addressed rationally. In addition to the accusations of unprofessionalism I have made above, Mr. Conroy still misleads (3 Ibid. ), omits19, attacks (18 Ibid. ), and accuses his opponents of supporting child molesters20. These degenerate behaviours cast a pall over the Rudd Government’s approach to the Internet, highlighting poor judgement on Mr. Rudd’s part in selecting Mr. Conroy to represent him him in these matters. In conclusion, I reiterate and expand the requirements I stated in my first letter. I require detailed responses to the criticisms contained herein, prepared with at least as much care and research as I’ve invested in preparing the criticisms in the first place. I require you to represent my interests as a constituent and one of this policy’s stakeholders during party room deliberations on the matter. I require you to convey to Mr. Conroy my demand for a written apology for his unprofessional conduct; and for your own public condemnation of same. And I request and require that you privately approach the Prime Minister, Mr. Rudd, with my call for Mr. Conroy’s resignation. However, moodle has become very popular (and is now being advocated by some members of SugarLabs) so I decided to check it out. After playing with the system itself, this teacher documentation page turned out to be a good starting point. This is my first activity using moodle with students. We started today with creating a Glossary of terms to do with the Human Body, my Year 8 Science class. The students enjoyed it, being able to type in their own meanings and to see the meanings that other students were entering. I'm off to a good start with moodle. I felt these terms had real meaning in the context of the activity I chose to begin with - that this section of the teacher documentation page reflected a real understanding of these concepts. Janet told me that David Wallace wanted to check out something on the XO. "Who is David Wallace?". I was informed he was a quadriplegic and blogger. Here is David's About Me. I had no idea. That is, no idea of the requirement of skin to make a touchpad respond. With a finger the pointer moves easily. But when I scrapped with the back of a pen over the touch pad and stylus area nothing at all happened. The things we don't notice. David wanted to check out the stylus function but unfortunately stylus development seems to have been discontinued. A phone call to Joel confirmed that. The picture below shows what was intended initially but as I say the stylus development has been discontinued. You need to download safari browser(now available for Windows too) to explore this. Then click the "enter lively kernel" tab at the above site. "Lively Kernel is alive on the web, meaning that you do not download it or install it"
It's a long video but if you watch the first 10 minutes you'll get the idea. You can move objects around on the screen by dragging, copy objects, edit objects, compose objects (drop one object on top of another and they stick together), scale objects, rotate objects, resize, write scripts, objects can inherit behaviour from other objects, etc. Greens Senator Scott Ludlam asked Senator Conroy (our Minister for Broadband, Communications and the Digital Economy) to explain why he had made an incorrect statement that Sweden, the UK, Canada and New Zealand had similar filtering systems to the one being proposed by him for Australia, pointing out that the systems are not mandatory in those countries. This question was on notice so Conroy had time beforehand to prepare his answer. Conroy read a prepared answer to the House but did not answer the point made by Ludlam about mandatory filtering. Scott Ludlam then followed up with four more questions, which Conroy declined to answer at that time. (2) Senator Conroy (our Minister for Broadband, Communications and the Digital Economy) has recently claimed that Sweden, the UK, Canada and New Zealand have already implemented something like what he is suggesting. Beyond the question of race, there are three domestic policy agendas that confront the US in this time of crisis, to which Obama must forge solutions: the problem of the American underclasses; the problem of the American working poor; and the need for a national gain-sharing deal between those who take the upside and those who wear the downside of globalisation.